Tacrolimus ointment and Pimecrolimus cream are also known as calcineurin inhibitors, or topical immunomodulators. 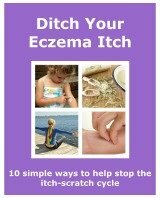 They are a second line treatment for eczema. An immunomodulator is a substance which affects the immune system. They work by blocking the production of an enzyme called Calcineum. Calcineurin is part of the inflammation process. It is produced by the white blood cells when the immune system responds to irritants and allergens. By decreasing the number of calcineurin, skin inflammation is lessened. So improving an eczema flare up, reducing redness and itching. Is also known as Tacrolimus Ointment. Its brand name is Protopic, with the active ingredient being Tacrolimus monohydrate. It is as effective as a potent topical steroid. It comes in two strengths. 0.1% and 0.03%. Both strengths can be used by anyone over the age of 16. The weaker ointment (0.03%) can be used by children over the age of 2 years. It is used to treat moderate to severe atopic eczema. Is also known as Pimecrolimus Cream. Its brand name is Elidel, with the active ingredient being Pimecrolimus. It is a 1% strength cream, and as effective as a moderate strength steroid treatment. It can be used on adults, and children aged over 2 years. It is used to treat moderate atopic eczema. Although they do the same job as a topical steroid, there are a couple of differences. They are not recommended as a first line treatment, unlike emollients and topical corticosteroids. A doctor will only prescribe calcineurin inhibitors when topical steroids are unable to clear a severe flare up. Also when someone has side effects or an allergy to the steroids. They can be used alongside eczema moisturizers. These emollients should be used very regularly to keep the skin supple and help prevent further damage. Tacrolimus ointment and Pimecrolimus cream are for short term use, or longer term use when used intermittently. Meaning not continuously, but having breaks between courses of treatment. They are not meant for long term use. They would be applied as soon as a flare up appears, reducing the chance of it worsening. It is applied thinly, twice a day until the flare up clears. Then emollients and topical corticosteroids can be used solely. If the flare up reappears, the treatment can be restarted. This must only be done under a doctor's supervision. Also if your skin worsens, or doesn’t clear up within 6 weeks, or 3 weeks for children, then visit your doctor. Not everyone is affected by side effects. The most common is a burning sensation and itching. Reports show that 1 in 3 people using the treatment are affected. It is normally a temporary side effect. It tends to last 2-3 days after starting use. Calcineurin inhibitors haven’t been used for long periods of times. So there are no studies on the long term effects of using them. There are concerns about the increased risk of skin cancer. This is because of the effect they have on the immune system. The worry is, that the skin's immune system may not be able to repair any damage done from ultraviolet light. As ultraviolet light comes from the sun, wearing sun cream and limiting sun exposure are recommended. It is not confirmed that this is a definite concern. As skin cancer normally appears in later life, prevention from the sun should be taken straight away. The best advice is to use the treatment as directed by your doctor. Also read the information leaflet that comes in the product's box. If they are used as directed, then reports suggest that they are safe to use short term.